Water in compressed air systems can lead to a range of technical maintenance and process problems. Whilst some compressed air applications, that can only tolerate low levels of water (instrument air, medical air and food air applications), use standard air drying technologies most other applications usually only need water-free air. For these users standard air drying technologies, which over-dry the air, represent an extra, unwarranted capital, maintenance and operational cost. The Dry Air Supply (DAS) technology is a simple, low maintenance compressed air drying system that not only provides liquid-free compressed air, but ensures that the compressed air, system pipework and components downstream of the dryer are free of liquid water. The DAS technology is scalable. DAS Technology can be designed to suit different compressor sizes and duty cycle usage patterns. Unlike standard air drying technologies, DAS technology is only operational when the compressor is turned on and its simple control system ensures a consistent, settable level of compressed air dryness; you can set your relative dryness level depending on your application, less water content for spraying, slightly more for power tools. If higher levels of water removal are required then the DAS technology can be used to complement refrigerant, desiccant and membrane type dryers. 2 Where does the water come from? If you are new to using compressed air then you’ve probably just realised that your air receiver contains lots of water. In addition, over time you may have also noticed that your system is full of other contaminants (scale, rust and oil) and that the supply of clean water free air is not as easy as it first seemed. Further, if you have been using your new off-the-shelf compressor to spray or blast with you may have noticed that your spray job looks a bit like the surface of the moon or that your grit blaster keeps getting choked up. These issues, along with many others, are most likely associated with water in your compressed air supply. Although water may be present in all parts of the system it generally collects along the bottom of the receiver where a helpfully placed drain plug is located to aid its removal. However, depending on how the compressor is used, its duty cycle, the receiver will need to be drained regularly in order to optimise air storage and stop water being blown directly into the rest of the compressed air system; drying a wet compressed air system can be a long and tedious process wasting time and money. After using your compressor for some time you most probably have built up a list of questions based on your observations and are wondering where you can find some answers to hopefully improve the performance, reduce running costs and improve the flexibility of your system. Questions such as: “Why do I get so much more water in the summer?”, “What are all these blisters and fishtails on my paint job?”, Why does my system perform better in winter?”, “If I run my compressor all day why does it perform worse in the mid-afternoon?” or more importantly, “Do I need to spend $1000 on a fridge” or “How do you get rid of water easily?”. Similarly, if you have just replaced an old compressor or are more familiar with using compressed air then you will be acutely aware of these problems, if not why they occur or how to solve them. You may have even purchased a cheap or second hand refrigerant dryer or sought advice from your local compressor supplier or even signed onto a yearly maintenance contract with the idea of pushing the problem onto someone else. Some of these potential solutions may work although the likelihood is that you will still have issues at some time or another and that without even a basic understanding of what is going on you will be back at square one. Atmospheric air contains water vapour. The compression process converts this water vapour into liquid water; more water vapour produces more liquid water. Normally the quantity of atmospheric water vapour is quoted in terms of a relative humidity (RH) figure which varies from 0% (completely dry air – very unlikely) to 100% (full saturated air – air which is unable to hold any more water vapour). Although the relative humidity figure is useful, the total amount of water contained within ambient air depends upon its temperature and pressure. Since atmospheric pressure variations are relatively small the amount of water vapour present is only really dependent upon the local temperature. 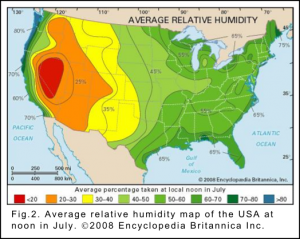 From a relative humidity map, Fig.2, of the US it can be shown that in most areas, during an average July day, that the average daily relative humidity is 40% and above. In the more arid desert regions, Arizona and Nevada northwards to the Canadian border, the RH can drop in some places to below 20% towards the end of the day although early morning readings even in these areas can be as high as 70%. The East Coast of the continent is more humid than the West as well as the coastal regions especially along the gulf coastline and from northern California to the Canadian border. In addition to variations due to location, the RH also varies during the day,with the morning generally being higher than the afternoons due to local weather and climate effects. The absolute humidity is the total mass (usually in grams) of water vapour present in a given volume of air. Unlike relative humidity it does not take the temperature or pressure of the air into consideration. The mixing ratio is the ratio of the mass of water vapour to the mass of dry air. Whilst the mixing ratio is generally the most useful figure the absolute humidity does provide a specific value for the amount of water present and is used more widely on this wiki. It often helps to understand the effects and properties of water and water vapour in air if we consider the air as a giant water vapour holding sponge, Fig2. For example, two separate 1m3 volumes of air, one at 20oC and the other at 40oC, having the same relative humidity (say 70%) will contain significantly different amounts of water vapour. 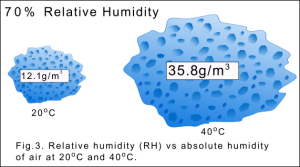 In this analogy the size of the sponge at 40oC, containing ~36g of water vapour per cubic metre of air, is significantly larger than that at 20oC which only holds ~12 grams of water vapour per cubic meter. So as the temperature of the air increases the sponge gets larger and so does its ability to hold water vapour. If the pressure of the air is increased the sponge is squeezed and its size and water vapour holding ability is reduced. However, since changes in ambient pressure are relatively small and humidity levels are usually well below 100% atmospheric pressure changes do not significantly change the size of the sponge. At 100% RH the air is said to be saturated and the sponge is unable to hold any more water vapour. If the temperature of the air drops (or the pressure increases) even slightly then the air will release this water vapour in the form of liquid water (rain). The temperature to which the air must be cooled (sponge shrunk) to become saturated is known as the dew point temperature. Since the size of the sponge also depends on the pressure, this becomes more relevant when we start compressing the air, the dew point temperature is given at a constant barometric pressure. 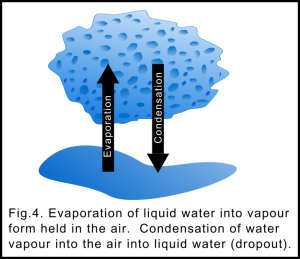 At the dew point temperature, the rate at which the water vapor in the air condenses into liquid water is the same as the rate of evaporation from liquid water to water vapour, Fig 3. At temperatures below the dew point liquid water is formed; the condensation rate is greater than the evaporation rate. We can see a great example of this by breathing out and misting a window pain on a cold day; our hot expelled breath, containing a high water vapour content, is cooled on the cold windows and water droplets are formed. Dry Air Supply (DAS) technology provide a simple low-cost means of producing water-free compressed air. This new technology provides compressed air with a constant, controllable level of water vapour content that is independent of compressor load variations.